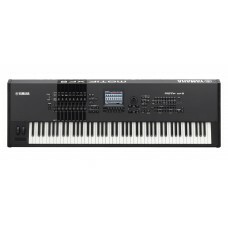 Arguably the leader in the keyboard workstation market, Yamaha ups the ante on their venerable MOTIF XS with the release of the XF8, the full-size version of their top-shelf production-powerhouse synth. Found only on this 88-key MOTIF, Yamaha's Balanced Hammer keyboard combines grand-piano touch with playability fit for the extensive variety of synths and expressive instruments that only a MOTIF can produce. Step into the spotlight with the industry-defining MOTIF sound engine in a beautiful white finish. The 40th Anniversary Edition MOTIF XF adds an eye-catching white finish to the MOTIF's incredible sound, expandability and computer integration. - Membership to broadjam.com -- a $100 value! Doubling the waveform memory of the XS to an impressive 741 MB, the MOTIF XF8 boasts 1,664 internal voices and 97 drum kits with expansion slots for another 2GB of samples. MOTIF veterans will recognize the front panel's 8 knobs and 8 sliders -- and appreciate the addition of tap tempo, a customizable user interface, and automapping of samples to keys with respect to pitch. When it comes to creating music, why limit yourself to anything less than the industry-standard Yamaha MOTIF XF8? If you're in the market for a instrument of this caliber, you're serious about sound -- and you may already know that the MOTIF series is famous for its deep sound library, including those realistic piano voices that an acoustic-piano manufacturer like Yamaha can truly capture. After all, when you're investing in an 88-key workstation, you want authentic pianos -- and the MOTIF XF8 delivers with 136 new voices, featuring exquisitely detailed samples of the 9-foot CFIII and 7-foot S6 Yamaha acoustic grands. Of course, because the MOTIF is such an overwhelmingly popular production tool, Yamaha knows there are hundreds of third-party voice libraries available to customize your MOTIF's already-colossal sound set -- so they've included 2 flash board slots that can support up to 1GB each of re-writable flash memory. From Yamaha's own "Inspiration In a Flash" libraries, to VST sounds, to your own recorded samples in the built-in 128 MB of sample RAM, you can now expand your MOTIF XF8 to a combined 3 GB of sounds -- all quickly searchable (even the third-party ones) via Yamaha's Category Search feature. It's not just the quantity of available voices that makes the MOTIF XF8 so special -- it's the quality. The MOTIF's celebrated 8-element-per-voice structure combined with Yamaha's XA (Expanded Articulation) technology yields strikingly smooth horns and winds, guitar harmonics, and key-release sounds of pianos for unmatched realism. Catering to true pianists, the MOTIF XF8 supports half-damper pedaling with Yamaha's available FC3 foot pedal. If larger-than-life synth sounds are more your style, 18 different filter types are at your service, controllable with the XF8's tactile knobs and sliders. And Yamaha's Virtual Circuitry Modeling technology recreates the warm and natural sound of vintage analog compressors, EQs, phasers, reverbs and more. There's even an on-board vocoder -- just plug in a microphone to the back of your XF8 to use your voice as an effect. No true workstation would be complete without a powerful on-board arpeggiator. Richly textured beats, chugging synths, and even simulations of acoustic instruments ignite your creativity with over 7000 types of arpeggios -- many with chordal intelligence capable of tweaking patterns in real time depending on the chords you play. Run 4 simultaneous arps and switch between 5 pattern variations in real time. The MOTIF XF8's direct performance recording feature lets you quickly capture your ideas. When it's time for serious masterpiece-creation, record MIDI and audio seamlessly with the XF8's 16-track Integrated Sampling Sequencer. Dual 1/4-inch analog inputs allow you to plug in your guitar or bass -- or even a standard XLR microphone with a Low-to-High impedance-matching transformer -- so you can record yourself singing or playing along with your XF8's sequencer. The Time Slice feature time-stretches digitally recorded audio so it follows your beat with perfect synchronization, even as you change the tempo of your song or pattern. "Roll tape" and punch in on the linear, tape-machine-style Song sequencer, or work with loops using the Pattern sequencer -- the XF8 lets you switch between modes at any time. The on-board sequencer is what makes a MOTIF keyboard a monster production powerhouse, and only the XF8 model pairs it with a 88-key keyboard. When you prefer to use your computer for recording or editing, the MOTIF XF8's remote control feature seamlessly integrates with Yamaha's bundled version of Steinberg Cubase AI. Bi-directional communication means your parameters always agree, whether you're moving the MOTIF's knobs or mousing on your computer screen. Install the optional FW16 FireWire expansion board to stream 16 tracks of audio to your DAW via a single FireWire cable. You can even use your MOTIF as a VST "soft synth" in Cubase (without taxing your computer's resources). Or import songs you've created in your MOTIF for further editing and mastering from the comfort of Cubase on your computer.